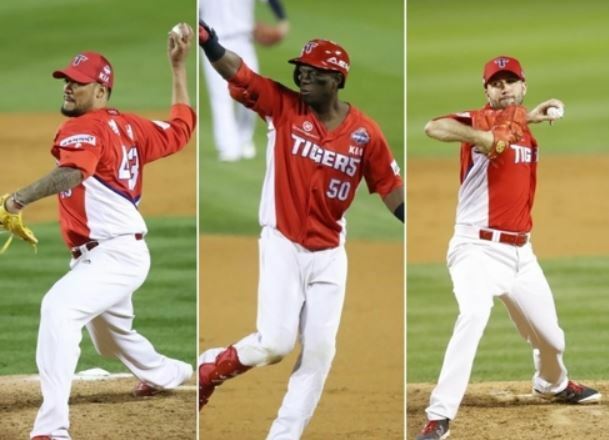 The reigning South Korean baseball champions Kia Tigers announced Thursday they've re-signed all three of their foreign players from the 2017 season. The Korea Baseball Organization club will bring back 20-game winner Hector Noesi for his third season. The Tigers also retained left-hander Pat Dean and outfielder Roger Bernadina for their second season in South Korea. Noesi signed for $2 million, up $300,000 in 2017. Dean will earn $925,000, a raise of $225,000, and Bernadina agreed to a $1.1 million deal, after making $750,000 this year. Noesi led the KBO with 201 2/3 innings pitched, and tied teammate Yang Hyeon-jong for the KBO-best 20 wins. In his two seasons with the Tigers, the former big leaguer is 35-10 with a 3.44 ERA in 61 starts. Dean went 9-7 with a 4.14 ERA in 30 starts. He was 4-2 with a 3.18 ERA after the All-Star break. Bernadina overcame a slow start to finish with a .320 batting average, 27 home runs, 32 steals, 111 RBIs and a league-high 118 runs scored. He's the first Kia player to score 100 and drive in 100 in the same season, and he's the franchise's first foreign player to join the 20-20 club. Bernadina batted .526 (10-for-19) with a homer and seven RBIs in the Korean Series, as the Tigers knocked out the Doosan Bears in five games to capture their first championship since 2009. Dean was the winning pitcher in Game 3, when he held the Bears to three runs over seven solid innings.